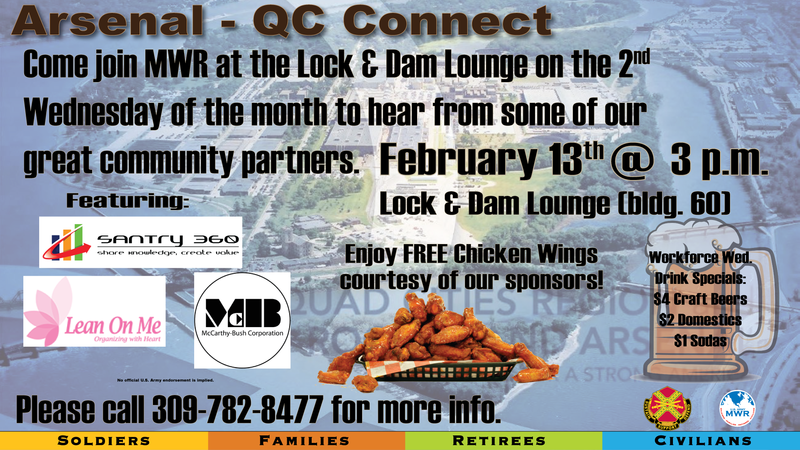 Date: Feb 13 2019, 3 p.m.
Come join MWR at the Lock & Dam Lounge on the 2nd Wednesday of the month to hear from some of our great community partners. For February we will be featuring Santry 360, Lean on Me and McCarthy-Bush Corporation. Get there early for FREE chicken wings courtesy of our sponsors and wash it down with a pint of Arsenal Pale Ale or Lock & Dam Lager which are only available at the Lock & Dam Lounge. Then after the good info from our sponsors, stick around for Workforce Wednesday specials including $4 craft beers, $2 domestics and $1 sodas from 4-6 p.m. Please call 309-782-8477 for more info.